The Sole Fitness B94 Upright Exercise Bike is Sole’s well built upright exercise bike for home use. A mid priced home bike with many features and solid quality. Upright bikes mount, just like a bicycle. The Sole B94 will provide an excellent cardiovascular workout with low impact on your joints. Sole exercise equipment is used in commercial settings and hotels (including Hilton Hotels). 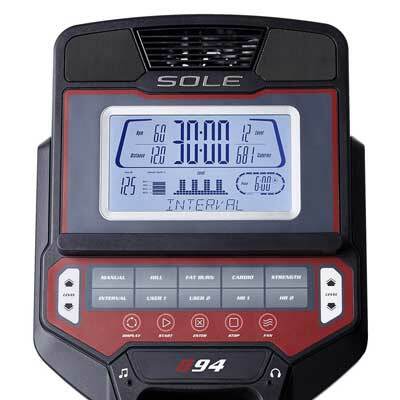 The Sole Fitness B94 features a 26 lb. flywheel, which creates a secure, quiet, vibration-free workout, as well as 20 levels ECB magnetic resistance. ECB is the best type and quiet form of magnetic resistance. Sole provides 10 programs (Six standard programs, Two custom programs, and Two heart rate programs). Adjustable seat and handlebars. Sole’s pedals are uniquely designed to prevent aches and pains in your knees and feet by aligning the joints in their correct posture during a workout. Sole’s heavy steel tubing, along with an aluminum shroud, makes SOLE bikes extremely strong, but also light. Sole B94 Upright Exercise Bike Features: The 9-inch LCD screen has a Blue Backlight for easy viewing. Integrated Speakers sound system for listening to your iPod or MP3 player while you exercise. Pulse grip heart rate monitoring (Chest Strap Compatible). Built-in Workout Fan (keeps you cool during your workout). The adjustable gel seat provides comfort while riding. Sole has added Bluetooth capability, which can send your bike workout data to a new Sole App on your smart phone or tablet. Smart-Review Commentary: The Sole Fitness B94 exercise bike is an excellent upright bike for home use. It is extremely solid and well built. Sole exercise equipment is used in commercial settings as they are heavy duty exercise machines. The heavier weight of the Sole B94 makes it more stable than cheaper exercise bikes. This model should fit most needs as its maximum user weight is 300 lbs. It is loaded with convenience features, and comfort features (cooling fans, stereo speakers, water bottle holder). This model has heart rate grips, and is Telemetry heart rate enabled (chest strap not included). The frame is built for added stability. Toe straps are included. 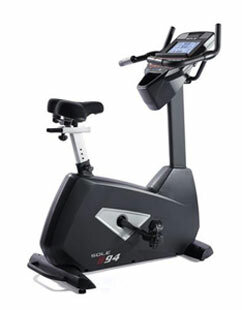 The Sole B94 has the same look and feel as the exercise bikes you would see at a commercial gym. This model has one of the best warranties for exercise bikes. Sole provides a padded Gel seat that is adjustable for added comfort. The Sole B94 has received excellent consumer reviews. The Sole Fitness B94 is a Smart-Review Top Pick for exercise bikes.